1914 document showing the official figures from the 1914 population census of the Ottoman Empire. The total population (sum of all the millets) was given at 20,975,345, and the Greek population was given at 1,792,206. The 1923 population exchange between Greece and Turkey (Greek: Ἡ Ἀνταλλαγή, translit. I Antallagí, Ottoman Turkish: مبادله‎, translit. Mübâdele) stemmed from the "Convention Concerning the Exchange of Greek and Turkish Populations" signed at Lausanne, Switzerland, on 30 January 1923, by the governments of Greece and Turkey. It involved at least 1.6 million people (1,221,489 Greek Orthodox from Asia Minor, Eastern Thrace, the Pontic Alps and the Caucasus, and 355,000 Muslims from Greece), most of whom were forcibly made refugees and de jure denaturalized from their homelands. The population exchange was envisioned by the new state of Turkey as a way to formalize, and make permanent, the flight of its native Greek Orthodox peoples following their genocide (1914–1922), while initiating a new exodus of a smaller number of native Muslims from Greece to supply settlers for the now depopulated Greek Orthodox villages of Turkey, while Greece saw it as a way to supply its masses of propertyless Greek Orthodox refugees from Turkey with lands to settle from the exchanged native Muslims of Greece. This major compulsory population exchange, or agreed mutual expulsion, was based not on language or ethnicity, but upon religious identity, and involved nearly all the indigenous Orthodox Christian citizens of Turkey (the Rûm "Roman/Byzantine" millet), including even Turkish-speaking Orthodox citizens, and most of the native Muslims of Greece, including even Greek-speaking Muslim citizens. Each group were citizens, and mostly native peoples, of the state seeking to expel them, and neither had representation in the state purporting to speak for them in the exchange treaty. By the end of 1922, the vast majority of native Asia Minor Greeks had fled the new state of Turkey due to the Greek genocide (1914–1922) there, as well as the later defeat of the Greek army in the Greco-Turkish War (1919–1922). According to some calculations, during the autumn of 1922, around 900,000 Greeks arrived in Greece. According to Fridtjof Nansen, before the final stage, in 1922, of the 900,000 Greek refugees a third were from Eastern Thrace, with the other two thirds being from Asia Minor. The Ottoman census of 1914 counted 13.4 million Muslims, 1.2 million Armenians and 1.8 million Greeks (but not the 600,000 Assyrian Christians, half of them in Turkey) an undercount of 1,200,000 Christians: 2.1 million Greeks, 1.9 million Armenians, 0.4 million Assyrians - 4.4 million. The Ottoman estimate of Christian population of 3 million within the present borders of Turkey was actually 4.4 million of the 17.5 million total. The estimate for the Greeks living within the present day borders of Turkey in 1914 is 2.130 million a figure higher than the 1.8 million Greeks in the Ottoman census of 1910 which included Western Thrace, Macedonia and Epirus. A revised count suggests 620,000 in Eastern Thrace including Constantinople (260,000, 30% of the city's population), 550,000 Pontic Greeks, 900,000 Anatolian Greeks and 60,000 Cappadocian Greeks. Christians were actually close to 25% of the population in 1912, not 18.9% as reported. There were 8.5 million people in the Ottoman governed Arabic-speaking regions of the Levant and Arabia of whom 1.6 million were Christian giving the total number of Christians in the Empire as just short of 5.8-6 million or slightly less than 23%. The most often given figure for Ottoman Greeks killed during WWI until 1923 is 550,000. Some estimates go as high as 750,000 which would suggest the Greek population was closer to 2.4 million, if true (the numbers of Armenians killed is 1.1-1.5 million and Assyrians 275-300,000 for a total including Greeks: 1.925-2.550 million. Arrivals in Greece from the exchange numbered 1,310,000: 260,000 from Eastern Thrace, 20,000 from the southern shore of the Sea of Marmara, 650,000 from Anatolia, 60,000 from Cappadocia, 280,000 Pontic Greeks, 40,000 left Constantinople (the Greeks there were permitted to stay, but those who had fled during the war were not allowed to return). Additionally 50,000 Greeks came from the Caucasus, 50,000 from Bulgaria and 12,000 from Crimea, almost 1.42 million from all regions. 340,000 Greeks remained in Turkey, 220,000 of them in Istanbul in 1924. By 1924 the Christian population of Turkey proper had been reduced from 4.4 million in 1912 to 700,000 (50% of the pre-war Christians had been killed), 350,000 Armenians, 50,000 Assyrians and the rest Greeks, 70% in Constantinople; and by 1927 to 350,000, mostly in Istanbul. The indications are that the Turks plan to eliminate the Greek element as enemies of the state, as they did earlier with the Armenians. The strategy implemented by the Turks is of displacing people to the interior without taking measures for their survival by exposing them to death, hunger, and illness. The abandoned homes are then looted and burnt or destroyed. Whatever was done to the Armenians is being repeated with the Greeks. Distribution of Anatolian Greeks in 1910: Demotic Greek speakers in yellow, Pontic Greek in orange and Cappadocian Greek in green with individual villages indicated. At the end of World War I one of the Ottoman's foremost generals, Mustafa Kemal Atatürk, continued the fight against the attempted Allied occupation of Turkey in the Turkish War of Independence. The surviving christian minorities within Turkey, particularly the Armenians and the Greeks, had sought protection from the Allies and thus continued to be seen as an internal problem, and as an enemy, by the Turkish National Movement. This was exacerbated by the Allies authorizing Greece to occupy Ottoman regions (Occupation of Smyrna) with a large surviving Greek minority population in 1919 and by an Allied proposal to protect the remaining Armenians by creating an independent state for them (Wilsonian Armenia) within the former Ottoman realm. The Turkish Nationalists' reaction to these events led directly to the Greco-Turkish War (1919–1922) and the continuation of the Armenian genocide and Greek genocide. After Mustafa Kemal Atatürk's capture of Smyrna followed by the abolition of the Ottoman Empire on November 1, 1922, over a million Greek orthodox Ottoman subjects had fled their homes in Turkey. A formal peace agreement was signed with Greece after months of negotiations in Lausanne on July 24, 1923. Two weeks after the treaty, the Allied Powers turned over Istanbul to the Nationalists, marking the final departure of occupation armies from Anatolia and provoking another flight of christian minorities to Greece. On October 29, 1923, the Grand Turkish National Assembly announced the creation of the Republic of Turkey, a state that would encompass most of the territories claimed by Mustafa Kemal in his National Pact of 1920. The state of Turkey was headed by Mustafa Kemal's People's Party, which later became the Republican People's Party. The end of the War of Independence brought new administration to the region, but also brought new problems considering the demographic reconstruction of cities and towns, many of which had been abandoned by fleeing minority christians. The Greco-Turkish War left many of the settlements plundered and in ruins. Meanwhile, after the Balkan Wars, Greece had almost doubled its territory, and the population of the state had risen from approximately 3.7 million to 4.8 million. With this newly annexed population, the proportion of non-Greek minority groups in Greece rose to 13%, and following the end of the First World War, it had increased to 20%. Most of the ethnic populations in these annexed territories were Muslim, but were not necessarily Turkish in ethnicity. This is particularly true in the case of ethnic Albanians who inhabited the Çamëria (Greek: Τσαμουριά) region of Epirus. During the deliberations held at Lausanne, the question of exactly who was Greek, Turkish or Albanian was routinely brought up. Greek and Albanian representatives determined that the Albanians in Greece, who mostly lived in the northwestern part of the state, were not all mixed, and were distinguishable from the Turks. The government in Ankara still expected a thousand "Turkish-speakers" from the Çamëria to arrive in Anatolia for settlement in Erdek, Ayvalık, Menteşe, Antalya, Senkile, Mersin, and Adana. Ultimately, the Greek authorities decided to deport thousands of Muslims from Thesprotia, Larissa, Langadas, Drama, Vodina, Serres, Edessa, Florina, Kilkis, Kavala, and Salonika. Between 1923 and 1930, the infusion of these refugees into Turkey would dramatically alter Anatolian society. By 1927, Turkish officials had settled 32,315 individuals from Greece in the province of Bursa alone. According to some sources, the population exchange, albeit messy and dangerous for many, was executed fairly quickly by respected supervisors. If the goal of the exchange was to achieve ethnic-national homogeneity, then this was achieved by both Turkey and Greece. For example, in 1906, nearly 20 percent of the population of present-day Turkey was non-Muslim, but by 1927, only 2.6 percent was. According to representatives from Ankara, the "amelioration of the lot of the minorities in Turkey' depended 'above all on the exclusion of every kind of foreign intervention and of the possibility of provocation coming from outside'. This could be achieved most effectively with an exchange, and 'the best guarantees for the security and development of the minorities remaining' after the exchange 'would be those supplied both by the laws of the country and by the liberal policy of Turkey with regard to all communities whose members have not deviated from their duty as Turkish citizens'. An exchange would also be useful as a response to violence in the Balkans; 'there were', in any event, 'over a million Turks without food or shelter in countries in which neither Europe nor America took nor was willing to take any interest'. The agreement promised that the possessions of the refugees would be protected and allowed migrants to carry "portable" belongings freely with themselves. It was required that possessions not carried across the Aegean sea be recorded in lists; these lists were to be submitted to both governments for reimbursement. After a commission was established to deal with the particular issue of belongings (mobile and immobile) of the populations, this commission would decide the total sum to pay persons for their immovable belongings (houses, cars, land, etc.) It was also promised that in their new settlement, the refugees would be provided with new possessions totaling the ones they had left behind. Greece and Turkey would calculate the total value of a refugee's belongings and the country with a surplus would pay the difference to the other country. All possessions left in Greece belonged to the Greek state and all the possessions left in Turkey belonged to the Turkish state. Because of the difference in nature and numbers of the populations, the possessions left behind by the Greek elite of the economic classes in Anatolia was greater than the possessions of the Muslim farmers in Greece. Norman M. Naimark claimed that this treaty was the last part of an ethnic cleansing campaign to create an ethnically pure homeland for the Turks. Historian Dinah Shelton similarly wrote that "the Lausanne Treaty completed the forcible transfer of the country's Greeks." The Refugee Commission had no useful plan to follow to resettle the refugees. Having arrived in Greece for the purpose of settling the refugees on land, the Commission had no statistical data either about the number of the refugees or the number of available acres. When the Commission arrived in Greece, the Greek government had already settled provisionally 72,581 farming families, almost entirely in Macedonia, where the houses abandoned by the exchanged Moslems, and the fertility of the land made their establishment practicable and auspicious. In Turkey, the property abandoned by the Greeks was often looted by arriving immigrants before the influx of immigrants of the population exchange. As a result, it was quite difficult to settle refugees in Anatolia since many of these homes had been occupied by people displaced by war before the government could seize them. More than one million two hundred and fifty thousand refugees who left Turkey for Greece after the war in 1922, through different mechanisms, contributed to the unification of elites under authoritarian regimes in Turkey and Greece. In Turkey, the departure of the independent and strong economic elites, e.g. the Greek Orthodox populations, left the dominant state elites unchallenged. In fact, Caglar Keyder noted that "what this drastic measure [Greek-Turkish population exchange] indicates is that during the war years Turkey lost ... [around 90 percent of the pre-war] commercial class, such that when the Republic was formed, the bureaucracy found itself unchallenged".The emerging business groups that supported the Free Republican Party in 1930 could not prolong the rule of a single-party without an opposition. Transition to multiparty politics depended on the creation of stronger economic groups in the mid-1940s, which was stifled due to the exodus of the Greek middle and upper economic classes. Hence, if the groups of Orthodox Christians had stayed in Turkey after the formation of the nation-state, then there would have been a faction of society ready to challenge the emergence of single-party rule in Turkey. In Greece, contrary to Turkey, the arrival of the refugees broke the dominance of the monarchy and old politicians relative to the Republicans. In the elections of the 1920s most of the newcomers supported Eleftherios Venizelos. However, increasing grievances of the refugees caused some of the immigrants to shift their allegiance to the Communist Party and contributed to its increasing strength. Prime Minister Metaxas, with the support of the King, responded to the communists by establishing an authoritarian regime in 1936. In these ways, the population exchange indirectly facilitated changes in the political regimes of Greece and Turkey during the interwar period. Many immigrants died of epidemic illnesses during the voyage and brutal waiting for boats for transportation. The death rate during the immigration was four times higher than the birth rate. In the first years after arrival, the immigrants from Greece were inefficient in economic production, having only brought with them agricultural skills in tobacco production. This created considerable economic loss in Anatolia for the new Turkish republic. On the other hand, the Greek populations that left were skilled workers who engaged in transnational trade and business, as per previous capitulations policies of the Ottoman Empire. While current scholarship defines the Greek-Turkish population exchange in terms of religious identity, the population exchange was much more complex than this. Indeed, the population exchange, embodied in the Convention Concerning the Exchange of Greek and Turkish Populations at the Lausanne Conference of January 30, 1923, was based on ethnic identity. The population exchange made it legally possible for both Turkey and Greece to cleanse their ethnic minorities in the formation of the nation-state. Nonetheless, religion was utilized as a legitimizing factor or a "safe criterion" in marking ethnic groups as Turkish or as Greek in the population exchange. As a result, the Greek-Turkish population exchange did exchange the Greek-Orthodox population of Anatolia, Turkey and the Muslim population of Greece. However, due to the heterogeneous nature of these former Ottoman lands, many other ethnic groups posed social and legal challenges to the terms of the agreement for years after its signing. Among these were the Protestant and Catholic Greeks, the Arabs, Albanians, Russians, Serbians, Romanians of the Greek Orthodox religion; the Albanian, Bulgarian, Greek Muslims of Macedonia and Epirus, and the Turkish-speaking Greek Orthodox. The heterogeneous nature of the groups under the nation-state of Greece and Turkey is not reflected in the establishment of criteria formed in the Lausanne negotiations. This is evident in the first article of the Convention which states: "As from 1st May, 1923, there shall take place a compulsory exchange of Turkish nationals of the Greek Orthodox Religion established in Turkish territory, and of Greek nationals of the Moslem religion established in Greek territory." The agreement defined the groups subject to exchange as Muslim and Greek Orthodox. This classification follows the lines drawn by the millet system of the Ottoman Empire. In the absence of rigid national definitions, there was no readily available criteria to yield to an official ordering of identities after centuries long coexistence in a non-national order. The Treaty of Sèvres imposed harsh terms upon Turkey and placed most of Anatolia under Allied and Greek control. Sultan Mehmet VI's acceptance of the treaty angered Turkish nationalists, who established a rival government at Ankara and reorganized Turkish forces with the aim of blocking the implementation of the treaty. By the fall of 1922, the Ankara-based government had secured most of Turkey's borders and replaced the fading Ottoman Sultanate as the dominant governing entity in Anatolia. In light of these events, a peace conference was convened at Lausanne, Switzerland in order to draft a new treaty to replace the Treaty of Sèvres. Invitations to participate in the conference were extended to both the Ankara-based government and the Istanbul-based Ottoman government, but the abolition of the Sultanate by the Ankara-based government on 1 November 1922 and the subsequent departure of Sultan Mehmet VI from Turkey left the Ankara-based government as the sole governing entity in Anatolia. The Ankara-based government, led by Mustafa Kemal Atatürk, moved swiftly to implement its nationalist programme, which did not allow for the presence of significant non-Turkish minorities in Western Anatolia. In one of his first diplomatic acts as the sole governing representative of Turkey, Atatürk negotiated and signed the "Convention Concerning the Exchange of Greek and Turkish Populations" on 30 January 1923 with Eleftherios Venizelos and the government of Greece. The convention had a retrospective effect for all the population moves which took place since the declaration of the First Balkan War, i.e. 18 October 1912 (article 3). However, by the time the agreement was to take effect, 1 May 1923, most of the pre-war Greek population of Aegean Turkey had already fled. 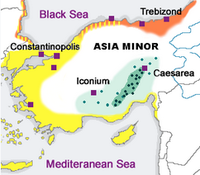 The exchange involved the remaining Greeks of central Anatolia (both Greek- and Turkish-speaking), Pontus and Kars. Thus of the 1,200,000 only c. 189,916 still remained in Turkey that time. In Greece, it was considered part of the events called the Asia Minor Catastrophe (Greek: Μικρασιατική καταστροφή). Significant refugee displacement and population movements had already occurred following the Balkan Wars, World War I, and the Turkish War of Independence. The convention affected the populations as follows: almost all Greek Orthodox Christians (Greek- or Turkish-speaking) of Asia Minor including the Greek Orthodox populations from middle Anatolia (Cappadocian Greeks), the Ionia region (e.g. Smyrna, Aivali), the Pontus region (e.g. Trapezunda, Sampsunta), the former Russian Caucasus province of Kars (Kars Oblast), Prusa (Bursa), the Bithynia region (e.g., Nicomedia (İzmit), Chalcedon (Kadıköy), East Thrace, and other regions were either expelled or formally denaturalized from Turkish territory. On the other hand the Muslim population in Greece not having been affected by the recent Greek-Turkish conflict was almost intact. Thus c. 354,647 Muslims moved to Turkey after the agreement. Those Muslims were predominantly Turkish Muslims, as well as ather communities such as Greek Muslims, Muslim Roma, Pomaks, Cham Albanians, Megleno-Romanians, and Dönmeh. Greek population in Istanbul and percentages of the city population (1844–1997). Pogroms and policies in Turkey led virtually to the exodus of the remaining Greek community. 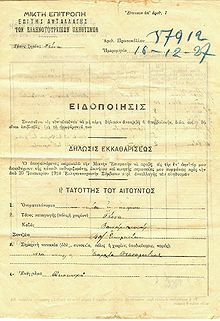 Declaration of Property during the Greek-Turkish population exchange from Yena (Kaynarca) to Thessaloniki (16 December 1927). The Turks and other Muslims of Western Thrace were exempted from this transfer as were the Greeks of Constantinople (Istanbul) and the Aegean Islands of Imbros (Gökçeada) and Tenedos (Bozcaada). In the event, those Greeks who had temporarily fled these regions, particularly Istanbul, before the entrance of the Turkish army were not permitted to return to their homes by Turkey afterwards. Greece, with a population of just over 5,000,000 people, had to absorb 1,221,489 new citizens from Turkey. The punitive measures carried out by the Republic of Turkey, such as the 1932 parliamentary law which barred Greek citizens in Turkey from a series of 30 trades and professions from tailor and carpenter to medicine, law, and real estate, correlated with a reduction in the Greek population of Istanbul, and of that of Imbros and Tenedos. Most property abandoned by Greeks who were subject to the population exchange was confiscated by the Turkish government by declaring them "abandoned" and therefore state owned. Properties were confiscated arbitrarily by labeling the former owners as "fugitives" under the court of law. Additionally, real property of many Greeks was declared "unclaimed" and ownership was subsequently assumed by the state. Consequently, the greater part of the Greeks' real property was sold at nominal value by the Turkish government. Sub-committees that operated under the framework of the Committee for Abandoned properties had undertaken the verification of persons to be exchanged in order to continue the task of selling property abandoned. The Varlık Vergisi capital gains tax imposed in 1942 on wealthy non-Muslims in Turkey also served to reduce the economic potential of ethnic Greek business people in Turkey. Furthermore, violent incidents as the Istanbul Pogrom (1955) directed primarily against the ethnic Greek community, and against the Armenian and Jewish minorities, greatly accelerated emigration of Greeks, reducing the 200,000-strong Greek minority in 1924 to just over 2,500 in 2006. The 1955 Istanbul Pogrom caused most of the Greek inhabitants remaining in Istanbul to flee to Greece. By contrast, the Turkish community of Greece has increased in size to over 140,000. The population profile of Crete was significantly altered as well. Greek- and Turkish-speaking Muslim inhabitants of Crete (Cretan Turks) moved, principally to the Anatolian coast, but also to Syria, Lebanon and Egypt. Conversely, Greeks from Asia Minor, principally Smyrna, arrived in Crete bringing in their distinctive dialects, customs and cuisine. According to Bruce Clark, leaders of Greece and Turkey, and some circles in the international community, saw the resulting ethnic homogenization of their respective states as positive and stabilizing since it helped strengthen the nation-state natures of these two states. Nevertheless, the deportations brought significant challenges: social, such as forcibly being removed from one's place of living, and more practical such as abandoning a well-developed family business. Countries also face other practical challenges: for example, even decades after, one could notice certain hastily developed parts of Athens, residential areas that had been quickly erected on a budget while receiving the fleeing Asia Minor population. To this day, Greece and Turkey still have properties, and even villages such as Kayaköy, that have been left abandoned since the exchange. ^ Giuseppe Motta (2013). Less than Nations: Central-Eastern European Minorities after WWI. 1. Cambridge Scholars Publishing. p. 365. ISBN 9781443854610. ^ Howland, Charles P. (1926). "Greece and Her Refugees". Foreign Affairs. 4 (4). ^ a b Matthew J. Gibney, Randall Hansen. (2005). Immigration and Asylum: from 1900 to the Present, Volume 3. ABC-CLIO. p. 377. ISBN 978-1-57607-796-2. The total number of Christians who fled to Greece was probably in the region of 1.2 million with the main wave occurring in 1922 before the signing of the convention. According to the official records of the Mixed Commission set up to monitor the movements, the "Greeks" who were transferred after 1923 numbered 189,916 and the number of Muslims expelled to Turkey was 355,635 [Ladas 1932, pp. 438–439]; but using the same source Eddy [1931, p. 201] states that the post-1923 exchange involved 192,356 Greeks from Turkey and 354,647 Muslims from Greece. ^ League of Nations, "The Settlement of Greek Refuges. Scheme for an International Loan," Geneva (October 30th, 1924). Retrieved 16 April 2018. ^ Harry J. Psomiades, "The Great Powers, Greece and Turkey and the armistice of Mudanya, October 1922. The Fate of the Greek Majority in Eastern Thrace," Presented at the "Conference on Human Rights Issues in the Eastern Mediterranean and Asia Minor" Hellenic-Canadian Federation of Ontario, Toronto, 21 May 2000. Retrieved 16 April 2018. ^ Midlarsky, Manus I. (2005). The Killing Trap: Genocide in the Twentieth Century. Cambridge University Press. pp. 342–343. ISBN 978-0-521-81545-1. ^ Ryan Gingeras. (2009). Sorrowful Shores: Violence, Ethnicity, and the end of the Ottoman Empire, 1912–1923. Oxford Scholarship. doi:10.1093/acprof:oso/9780199561520.001.0001. ISBN 9780199561520. ^ a b Ryan Gingeras. (2009). Sorrowful Shores: Violence, Ethnicity, and the end of the Ottoman Empire, 1912–1923. Oxford Scholarship. doi:10.1093/acprof:oso/9780199561520.001.0001. ISBN 9780199561520. ^ Karakasidou, Anastasia N. (1997). Fields of Wheat, Hills of Blood: Passages to Nationhood in Greek Macedonia 1870–1990. University of Chicago Press. ^ a b Umut Özsu. Formalizing Displacement: International Law and Population Transfers. Oxford: Oxford University Press, 2015. ^ Mustafa Suphi Erden (2004). The exchange of Greek and Turkish populations in the 1920s and its socio-economic impacts on life in Anatolia. Journal of Crime, Law & Social Change International Law. pp. 261–282. ^ Gursoy, Yaprak (Summer 2008). "The Effects of the Population Exchange on the Greek and Turkish Political Regimes in the 1930s". East European Quarterly. 42 (2): 95–122. ^ Suphi Erden, Mustafa (April 2004). "The exchange of Greek and Turkish populations in 1920s and its socio-economic impacts on the life in Anatolia". Crime, Law and Social Change. 41 (3): 261–282. ^ a b c BI ̇RAY KOLLUOG ̆LU. (2013). "Excesses of nationalism: Greco-Turkish population exchange". Nations and Nationalism. 19 (3): 532–550. doi:10.1111/nana.12028. ^ Gilbar, Gad G. (1997). Population Dilemmas in the Middle East: Essays in Political Demography and Economy. London: F. Cass. ISBN 978-0-7146-4706-7. ^ Kantowicz, Edward R. (1999). The rage of nations. Grand Rapids, Mich: Eerdmans. pp. 190–192. ISBN 978-0-8028-4455-2. ^ Crossing the Aegean: The Consequences of the 1923 Greek-Turkish Population Exchange (Studies in Forced Migration). Providence: Berghahn Books. 2003. p. 29. ISBN 978-1-57181-562-0. ^ "Greece and Turkey – Convention concerning the Exchange of Greek and Turkish Populations and Protocol, signed at Lausanne, January 30, 1923  LNTSer 14; 32 LNTS 75". worldlii.org. ^ Koliopoulos, John S.; Veremis, Thanos M. (2010). Modern Greece a history since 1821. Chichester, U.K.: Wiley-Blackwell. p. 94. ISBN 978-1-4443-1483-0. ^ Pentzopoulos, Dimitri (2002). The Balkan exchange of minorities and its impact on Greece ([2. impr.]. ed.). London: Hurst. p. 68. ISBN 978-1-85065-702-6. Retrieved 9 June 2013. At the time of the Lausanne Conference, there were still about 200,000 Greeks remaining in Anatolia ; the Moslem population of Greece, not having been subjected to the turmoil of the Asia Minor campaign, was naturally almost intact. These were the people who, properly speaking, had to be exchanged. ^ Renée Hirschon. (2003). Crossing the Aegean: an Appraisal of the 1923 Compulsory Population Exchange between Greece and Turkey. Berghahn Books. p. 85. ISBN 978-1-57181-562-0. ^ George Kritikos (2000). "State policy and urban employment of refugees: The Greek case (1923–30)". European Review of History: Revue Européenne d'Histoire. 7 (2): 189–206. doi:10.1080/713666751. ^ Vryonis, Speros (2005). The Mechanism of Catastrophe: The Turkish Pogrom of September 6–7, 1955, and the Destruction of the Greek Community of Istanbul. New York: Greekworks.com, Inc. ISBN 978-0-9747660-3-4. ^ Tsouloufis, Angelos (1989). "The exchange of Greek and Turkish populations and the financial estimation of abandoned properties on either side". Enosi Smyrnaion. 1 (100). ^ a b c d Lekka, Anastasia (Winter 2007). "Legislative Provisions of the Ottoman/Turkish Governments Regarding Minorities and Their Properties". Mediterranean Quarterly. 18 (1): 135–154. doi:10.1215/10474552-2006-038. ISSN 1047-4552. ^ Metin Herer, "Turkey: The Political System Yesterday, Today, and Tomorrow," in Contemporary Turkey: Society, Economy, External Policy, ed. Thanos Veremis and Thanos Dokos (Athens: Papazisi/ELIAMEP, 2002), 17 – 9. ^ Yildirim, Onur (2013). Diplomacy and Displacement: Reconsidering the Turco-Greek Exchange of Populations, 1922–1934. Taylor & Francis. p. 317. ISBN 978-1-136-60009-8. ^ According to the Human Rights Watch the Greek population in Turkey is estimated at 2,500 in 2006. "From 'Denying Human Rights and Ethnic Identity' series of Human Rights Watch" Archived July 7, 2006, at the Wayback Machine Human Rights Watch, 2 July 2006. Archived July 7, 2006, at the Wayback Machine. ^ Clark, Bruce (2006). Twice A Stranger: How Mass Expulsion Forged Modern Greece and Turkey. Granta. ISBN 978-1-86207-752-2.